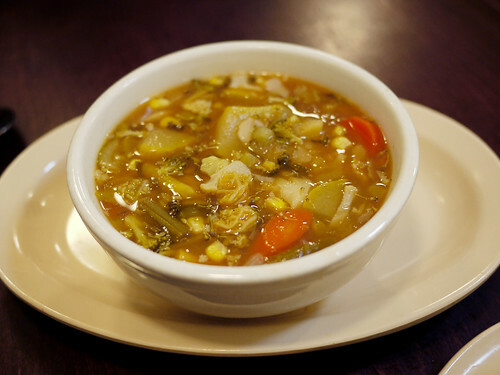 You can only get the vegetarian vegetable soup on Tuesdays, Thursdays and Fridays so lucky me to try it today. It's exactly as I thought, a generic broth base with every vegetable under the sun thrown in there. I'm pretty sure I saw cauliflower, broccoli, corn, mushrooms, carrots, zucchini, potatoes and green beans, just to mention a few. But the real reason we went to Eisenberg's was for the pastrami and egg sandwich featured on Serious Eats just a few days ago. Ours came out in more of an omelet scramble, and it wasn't bad, but we were really hoping for fluffy eggs accompanied by pastrami.